Following these shows, I’m off to the NFL Owners Meetings in Phoenix, AZ for three days where I’ll sit down with Redskins President Bruce Allen. Hear it all on 106.7 The Fan and Radio.com. Here’s where you can find me through next Monday! Filling in for Dukes alongside Chris Russell on Monday! 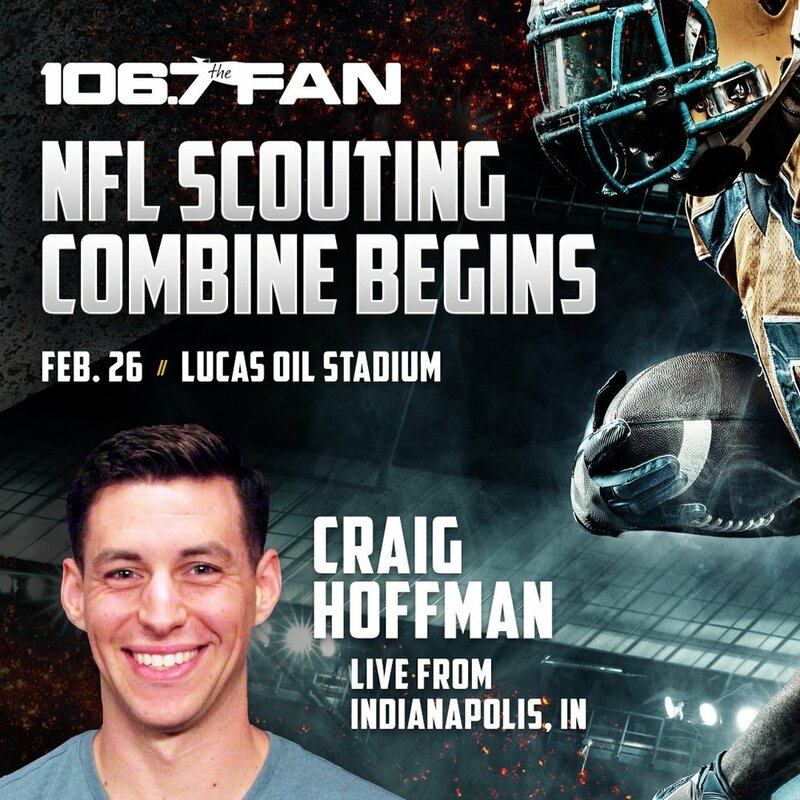 Back on the radio over the next week, including a trip to Indy for the NFL Combine! Plus podcast and YouTube content for Train With The Best! Our TWTB YouTube Page Is Live! As you may know, I’ve taken on quite the side venture of the last two years. The Train With The Best Podcast has grown tremendously into a must-listen for fitness professionals as Chris Gorres and I talk about various challenges we face in the fitness industry. As of January, we now have even more to offer! Our Train With The Best YouTube page is now live, and quickly filling up with all kinds of content. We have tutorials, workouts, product reviews and more. We even have video clips of our podcast and will be (hopefully!) having all our pods on video from Indianapolis. Check out the channel here and pretty please subscribe! YouTube has funny algorithms and rules that limit certain features without a set number of subscribers, so growing the page really does help unlock its potential. Thanks for the support of the pod and we’ll see you on your favorite YouTube viewing device! A few years ago, I read one of the most impactful pieces of journalism I’ve ever read. The piece was “Split Image” by Kate Fagan of ESPNW. It is the story of a 19-year-old runner at Penn named Madison Holleran, whose life seemed perfectly happy and normal on social media and to anyone who knew her tangentially. However, ‘Maddy’ was deeply depressed. Eventually the depression overtook her and she took her life. After reading the piece, I was determined to never look at social media the same. I was always going to make sure I knew what was really going on with those closest to me. Additionally, if there was a time where I could share something that wasn’t a highlight, I was going to. While there is no way you would know it unless you’re well within my inner circle, the last two weeks have been a struggle. Considering the incomprehensible heartbreak of the setup above, I feel it’s important to say that I’m perfectly okay and was never in any kind of real danger. I was just really, really emotionally spent to the point that it physically hurt. I think this is important to share because, as Kate’s piece lays out, often social media consists only of our life’s highlights. This is not life. We are far more than our highlights, and sharing these struggles is not meant to bring anyone down. In fact, in sharing how I’ve been able to keep pushing forward, maybe I’ll be able to help lift someone up. We all need a boost. I was able to find mine. Maybe this can be yours. The struggles of the last few weeks have taken a few forms. Some are very public. Some are not. I’m sure many of the people reading this are aware we lost a tremendous colleague in Rich Tandler on the Redskins beat a few weeks ago. Not only did that affect me, but it greatly affected many people close to me. That was hard. It still is hard. Life is hard, but we also were able to meet Rich’s family and friends, coming together in a way we otherwise would not have. Even when life is bad, it can bring us good. Sometimes that good flies in the face of great evil. I’m not sure I’ve fully processed the massacre in Pittsburgh last weekend, and I’m not sure I ever will. Frankly, I’m not sure I’m capable. It just might be too close to home. My parents and grandmother regularly attend community events at their temple. My sister travels to synagogues all around the country for a living. The ease of which Saturday’s shooting could have literally struck my family is difficult to think about, nevertheless fathom. Just as difficult is the reality that we live in a time and place where there are people who want me and people like me dead because of our religion. That time is 2018 and that place is America. How are you supposed to find the good in that? Well, you can’t help it when a community responds like Pittsburgh did. The city’s Muslim community raised $70,000 for the shooting’s victims because Islam, like Judaism, is a religion of love and not hate. At vigils, mourners refused to think it was too soon to act on a more massive level, chanting “vote! vote! vote!” ahead of next week’s elections. It’s never too soon to “politicize” a tragedy knowing that a change in our elected officials can change our culture and our laws to make us all safer. As a side-note: please f’ing vote. The above compounded a stressful time personally. The details of that are not for a blog other than that stress has all but gone away thanks to the people I care about most and that care the most about me. Turned out, the formula was somewhat simple. When you care about people, approach them as such. Entering a conversation with someone with the intention showing them you care, no matter what else happens in the conversation, goes a long, long way and it can come back in spades. It allows an honesty that can lead to real progress, whatever that may be based on the problems at hand. This is vague on purpose, as it can easily to apply to almost any meaningful personal or professional relationship. In this specific instance, I found myself needing my friends and family throughout the past few weeks, but especially when things reached a fever pitch this weekend. I told them I was vulnerable and reached out my hand. They reached back and pulled me up with care. In order for this to work, it’s imperative that you’re honest as you talk to people about what you’re going through, and that starts with being honest with yourself. It starts with saying “I don’t feel right and I can’t shake it.” If you could shake it, you’d do that. You don’t need to find a solution in that moment. You need to find the people who want to help you find the solution, and that’s a hell of a lot easier to find. I knew who I could go to and those people came through for me. I had a support system, I leaned on it and it held me up. As mentioned, life is hard. No need to go through it alone. A stretch like this also makes me realize how lucky I am. I’m completely aware that not everyone can so easily get back on their feet for any number of reasons. Perspective can be powerful at a time like this, too. As serious as all that is and was, this was a roller-coaster meaning there were highs, too. Some were simple, fun, memorable and meaningful times with some of the same people I referenced above. Others were professionally rewarding experiences. There was even the ultimate high of seeing someone I care about immensely achieve an ultimate dream, leaving me overwhelmed with happiness and pride. However, one other positive in particular stands out in terms of this blog, because it actually gave me the idea to write it. Why are certain people in our lives? Are we doing the things we need to to maintain those relationships? Are we maintaining them on the level they deserve? Additionally, how often do you check in with yourself? Are you doing the things you need to do to make sure you’re okay and are you honest with yourself with where you’re at? And thus, this blog. For the last few weeks, things weren’t the best, but I heal by sharing. That doesn’t mean I share everything with everyone, but getting the thoughts out is therapeutic. I’m doing better now, but it took real work and real help from people who I sincerely love, and thankfully they’ve continuously loved me back. I’m not afraid to admit that. Nobody’s life is great all the time. We are more than our highlights, and that’s more important to share than the highlights themselves.